Oriental cockroaches survive well outdoors and they spend a good amount of time there. They are resilient and have been observed surviving outdoors during 13 weeks of almost continuous freezing. They are usually found under debris, stones and leaf litter, but also in wall voids. They enter buildings under doors, along utility pipes and air ducts, unscreened ventilators and floor drains. Once indoors, they usually are found in crawl spaces, cellars, basements and on the first floor. They use water pipes to climb to higher floors. 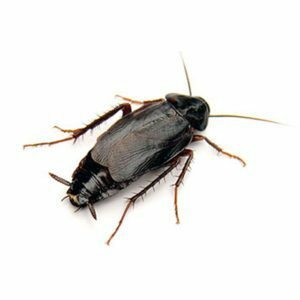 This cockroach emits a strong “roachy” odor and is considered the worst roach to be seen in a building. Like other cockroaches, it is a threat to food safety. Shiny reddish brown; later instars are dark reddish brown to black. About 1 inch (25 millimeters) to 1 ¼ inches (32 millimeters) long. Adult males are about 1 inch (25 millimeters) long; Adult females about 1 ¼ inches (32 millimeters) long. Shiny reddish brown; later instars are dark reddish brown to black. A variety of food and decaying organic matter with a preference for starchy foods. The female deposits her ootheca (egg capsule with 16 eggs) within 30 hours after it is formed. She either drops or glues it to something in a warm, protected area near a food source. The female will produce about 8 oothecae. The large, bean-shaped ootheca is reddish brown when deposited, changing to black; about 3/8 of an inch (8-10 millimeters) long, the width one-and-a-half times the length. It’s difficult to eliminate Oriental cockroaches indoors when they are abundant outdoors.